Delloreese Patricia Early was born in the Black Bottom neighborhood of Detroit in 1931. The neighborhood got its name from French colonial settlers impressed by the regions fertile soil. She told The Times in 1997, “Everything was a bill in our house. There was a grocery bill. Rent was a bill and the cleaning was a bill.” Her father would take what money was left and gamble. “Sometimes he’d win and it’d be good times, and if he didn’t win, it wouldn’t be such a good time.” By the age of six Delloreese was singing gospel in a local church. When she was twelve one of her cousins were killed in the Detroit Riots. When she was thirteen she was paid to sing in Mahalia Jackson’s gospel choir. After graduating from high school at the age of 15, her mother died. When her father started a new dating relationship and had his new girlfriend move into the house, Delloreese moved out and got work as a dental receptionist, elevator operator and truck driver. She also performed in clubs and changed her name on the billing from Delloreese Early to Della Reese. She continued to tour with Mahalia Jackson and credits Jackson with teaching her “how to communicate with people through song.” While on tour in the segregated South, Reese had to use the bushes when “colored” bathrooms weren’t available. 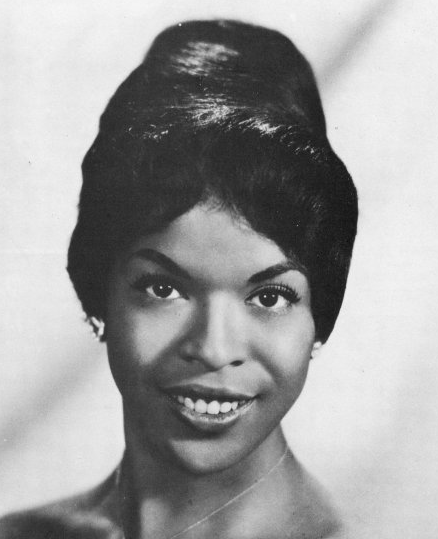 In the early 50’s Della Reese won a contest which earned her a week’s billing at Detroit’s Flame Show Bar. She ended up being on the bill for eight weeks. In 1953 she got a recording contract with Jubilee Records and also became a singer with the Erskine Hawkins Band. In 1955 she released a cover of Cole Porter’s 1937 composition “In The Still Of The Night”. She sang that song when she appeared on Stage Show, hosted by Tommy and Jimmy Dorsey. In 1957 Reese had a Top Ten hit on the Billboard Pop charts with “And That Reminds Me”, which climbed to #9. The song’s tune was from the Italian instrumental, “Autumn Concerto”, by Camillo Bargoni. She won the title for “The Most Promising Singer” in 1957 by both Billboard and Cashbox magazines. In 1958 Reese appeared in the film Let’s Rock singing “Lonelyville”. She co-starred with Paul Anka, Julius LaRosa, Danny & The Juniors, Roy Hamilton, the Royal Teens and Wink Martindale. In 1959 Della Reese switched to RCA Victor and released “Don’t You Know”. The song was adapted from “Musetta’s Waltz”, one of the songs from Giacomo Puccini’s La bohème. The song climbed to #2 on the Billboard Hot 100 and got her a Grammy Award nomination for Best Female Vocalist. This earned her nine years of constant performing in Las Vegas. Her follow up single was “Not One Minute More”. The song made the Top 20 on the Billboard Hot 100. 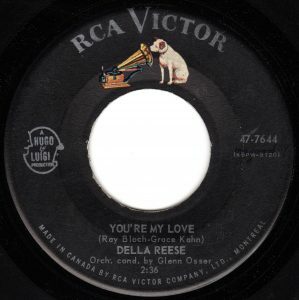 The B-side, “You’re My Love”, also charted in Vancouver, climbing to #5. “You’re My Love” is a song about a totally fulfilling and enthralling romantic relationship. The concluding lines are “Take my hand. Take my heart. Say we’ll never part. I’m yours. And you’re my love.” This sums up the song’s conviction. In addition to its peak at #5 in Vancouver, “You’re My Love” made the Top 20 in St. Louis, Missouri. She made the Top 40 in Vancouver later that spring with “Someday (You’ll Want Me To Want You)”. In 1960 she was featured in jukebox advertisements in Ebony magazine. That year she won a Grammy Award nomination for her album, Della. Della Reese released twenty-four more singles between 1960 and 1971. While beautiful, they didn’t catch on with the ever-changing rock ‘n roll radio market. In 1965 she left RCA and signed with ABC-Paramount. A further switch to Avco Embassey Records in 1969 saw her record Joe South’s “Games People Play” and Bobby Darin’s “Simple Song Of Freedom”. Between 1957 and 1970 she released sixteen studio albums. She returned again to the recording studio in 1994 to record Blue Skies, and in 2006 to record Give It To God. Over the years she also released eight live albums. She was nominated on two more occasions for Grammy Awards. These were for Female Soul Gospel Performance (“You Gave Me Love”) in 1987 and Traditional Soul Gospel Album (“Live! My Soul Feels Better Right Now”) in 1998. Della Reese is also known as an actress and between 1968 and 2014 she appeared in over 300 TV show episodes. Some of the TV series she appeared in include The Ray Anthony Show, The Mod Squad, Sanford and Son, Chico and the Man, The Love Boat, Welcome Back Kotter, The Young and the Restless, Grace, MacGyver, L.A. Law and Touched by an Angel. In the latter TV series, Della Reese won a Golden Globe Award for Best Supporting Actress – Series, Miniseries or Television Film. In 1970 she became the first African-American woman to host The Tonight Show Starring Johnny Carson. In addition to her television appearances, Della Reese appeared in over a dozen films between 1958 and 2012. She also appeared in the TV mini-series, Roots: The Next Generations. She received a star on Hollywood’s Walk of Fame in 1994. Her 1997 autobiography, Angels Along the Way: My Life With Help From Above, detailed a life of troubles. These included a first marriage to a husband who beat her and two miscarriages with a man she didn’t marry. In 1979 she suffered a near-fatal brain aneurysm. She was married three times. In 1983 her marriage to concert producer Franklin Lett Jr. coincided with her decision to become a minister with the Unity church. She was known in her role as a pastor as The Rev. Della Reese Lett. In 2017 Della Reese died at the age of 86. She suffered from Type-2 diabetes. Della Reese, “In The Still Of The Night“, Stage Show, CBS, 1955. Della Reese, “Lonelyville“, Let’s Rock, Columbia Pictures, 1958. Christie D’Zurilla, Della Reese, Singer, Actress and ‘Touched by an Angel’ Star, Dies at 86, Los Angeles Times, November 20, 2017.